A blog reader recently asked my opinion of on-line divorce education, such as People of Divorce. While I have not joined any such enterprise and therefore have not viewed their products directly, I won’t let that stop me from offering an opinion! Divorce education while helpful, is no panacea. In most states, including Wisconsin, it is now mandatory where there is minor children. Does anyone really think that has made any difference? I suppose that, like chicken soup, it can’t hurt, but I can’t really say that I know of one case where the parties have benefited from the mandatory education requirement. I suspect the reason is that the lessons learned has a short shelf life. 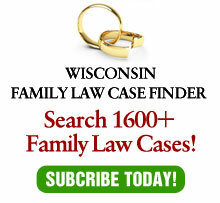 First, divorce law is based mostly on state law. So information from another state – or nationally based – may be not helpful at best and and can be misleading at worst. Second, there is no substitute for simple experience. For example, experienced lawyers know the parameters of short-term, medium-term and long-term marriage. That knowledge does not come from books – but only from practicing in this field. As I tell clients, you are paying me for my gray hair – and I’ve earned every one of them! So for basic information, these sites are fine. But, for deeper knowledge, a person considering a divorce should also consult a licensed therapist and an experienced attorney.